Rochelle Marie Arsenault looks like the stereotypical girl next door. 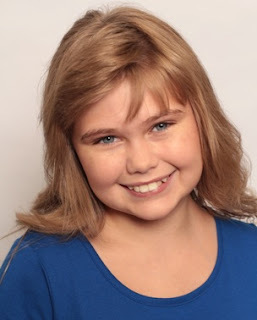 This blonde-haired, blue-eyed 10-year-old loves cats, reading comics, and playing with her friends. She was also just invited to the International Performing Arts Academy’s prestigious Hollywood Showcase in Los Angeles next May. Arts Academy’s Hollywood Showcase in May, 2016. The Hollywood Showcase is a four day event held at the Millenium Biltmore Hotel in Los Angeles, where new young actors, models and singers audition for industry agents, producers and casting directors. Rochelle will have her hair styled and makeup done by some of the biggest names in the industry. A number of Showcase participants have gone on to become big names. Going to the Hollywood Showcase involves some expenses, as well. The cost to send the young budding actress and her parents to Los Angeles for the four day event isn’t cheap. Her family is committed to accompanying her to the event. To help her raise money to offset the family’s expenses, however, her family started a fund-raising campaign on IndieGoGo (visit the fundraiser page at http://igg.me/at/ItsMeRochelleMarie). The family is actively seeking friends, family members and even local businesses to sponsor Rochelle’s trip to Hollywood. Perks being offered include a free copy of Rochelle’s first book, “Lonnie’s Lemonade,” an autographed 8×10 photo, up to and including having Rochelle in a commercial for businesses willing to sponsor her. For further information visit her web site at http://ItsMeRochelleMarie.com.